How fast and reliable is your favourite SaaS tool? That’s the question we wanted to answer when we did this web performance study. The goal of any SaaS business is to provide an online service and help customers to complete a specific job. But when this service is “down”, it’s the users’ business that are being put on “hold”. That’s the reason why uptime is money! From Mailchimp to Slack, we monitored the uptime and site speed of the world’s top 100 SaaS during 30 days. But unlike our previous studies, we went a step further by taking a peek inside their web frameworks and technologies. Let’s discover together the performance of the biggest SaaS businesses! What web framework do they use on their site? 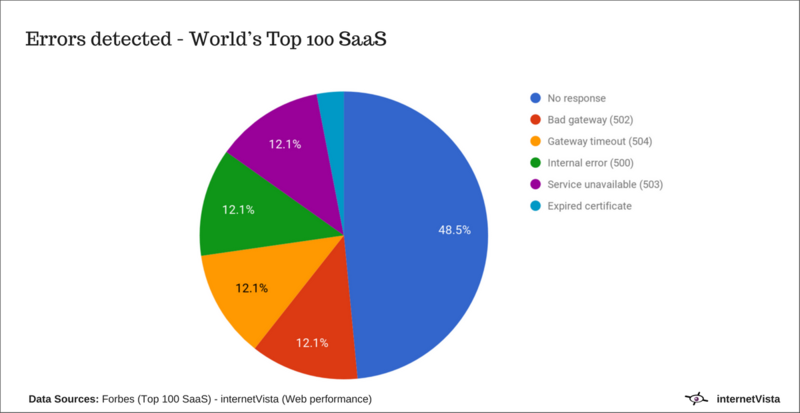 How reliable are the biggest SaaS companies? Who has the fastest (and slowest) website? 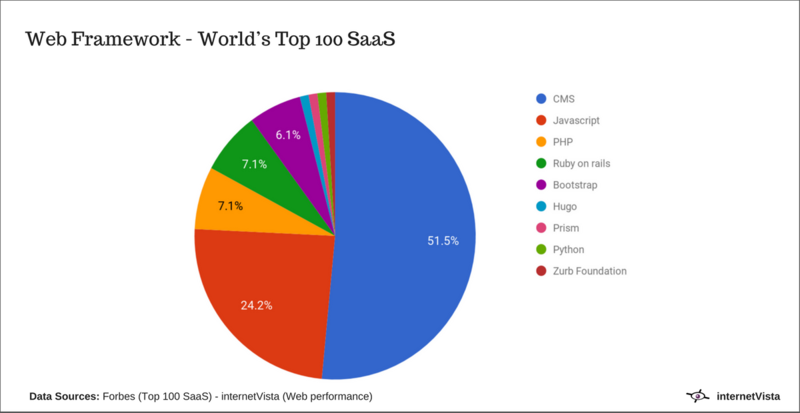 More than 50% of SaaS are built under a CMS! According to recent survey, microsoft web servers power 43% of all sites in the internet. But Nginx and Apache remain the leaders when it comes to “active sites“. We actually noticed the same trend after checking every site on the list. 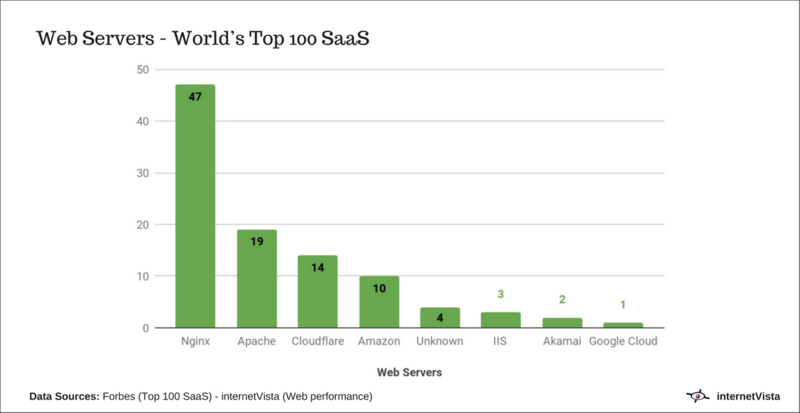 Nginx is clearly the most adopted web server amongst the biggest cloud companies. As a matter of fact, 67% of the websites managed to have 0% of downtime! This good score means that a vast majority of them are reliable and allow their customers to accomplish their job! Unfortunately, 33% of them faced big outages! 22 hours and 18 minutes. That’s the total amount of downtime accumulated by the top SaaS players. While the uptime is better than the e-commerce, some companies should really be worried about their performances. The most impacted SaaS are: Yardi (26th), Medalia (7th) and Datastax (66th). The 3 of them were down all together for a total of 16 hours! Being down is one thing, knowing why is another! While this error may seem “OK”, the consequences are real! Because starting from July, Google chrome will mark non https sites as unsecured. In other words, if this happens on your site, you can say goodbye to your conversions! 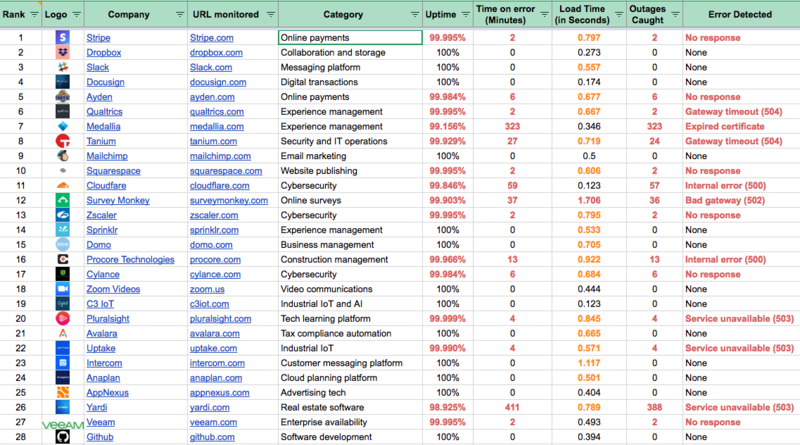 ⚠ Discover all the errors detected amongst the Top 100 SaaS! 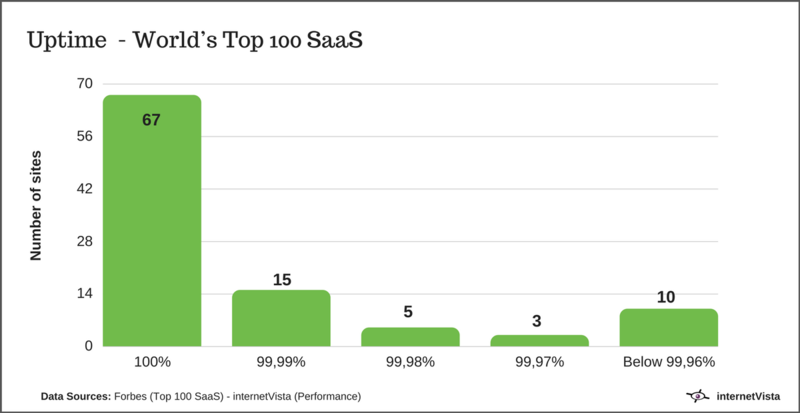 In average, the top 100 SaaS load under 0.5 second! This is a good score especially since Google use page speed as a ranking signal for SEO. Note that our report is based on desktop and doesn’t include mobile load time. 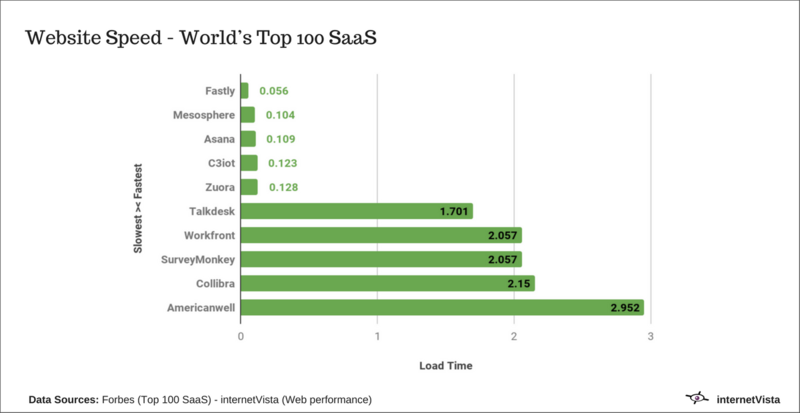 The fastest SaaS are: Fastly (cloud service), Mesosphere (Data software) and Asana (Collaboration). 🚀 Click here to see the website speed from the top 100 SaaS! Uptime is the one metric that matters for SaaS! Of course there are other important metrics but monitoring your web performances should be a priority. Because site speed and uptime can crush the user’s experience…and your business growth! The methodology used remains almost the same as our previous studies. The data collected for the web performance (uptime & load time) come from internetVista monitoring tool. 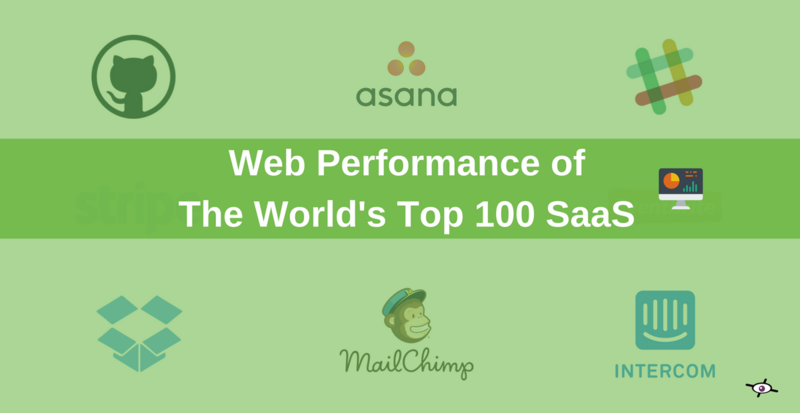 📊 Click here to access to the web performance from the top 100 SaaS companies! No one is immuned to downtime! 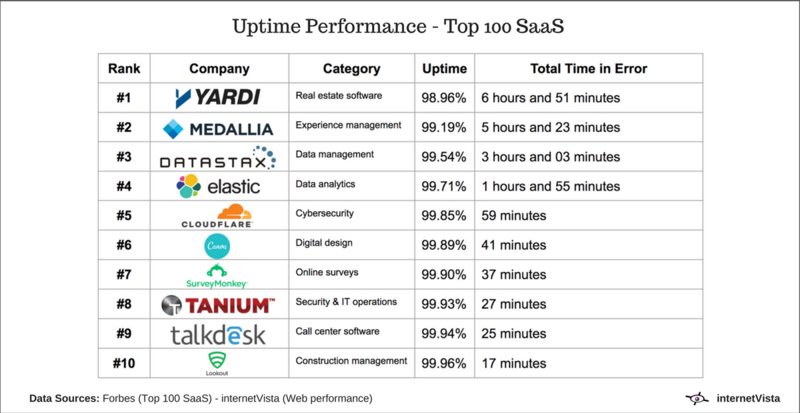 As shown in this report, even the biggest SaaS companies suffer from downtime. And we’re talking about the biggest players in the cloud industry with big teams and large financial means. In 2018, you should stop wondering if your SaaS is available or not. Instead, start monitoring your platform reliability and provide the best experience to your users!